The Capella de Ministrers are back with an exploration into the life and times of the mystic Ramon Llul; and Dialogos traces the oral roots of Dalmatian chant. I. Ramon Llull: Ars Antiqua. Capella de Ministrers CD 1637. 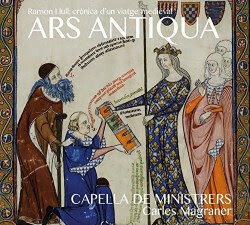 Musica Reservata BarcelonaCarles Magraner proposes a musical journey around the Medieval Mediterranean to the hand of one of the most important theologists and philosophers of the History: Raymundus Lullus. The musical references of his writings are brief but fundamental. In the "Revelatio Secretorum Artis" the 18th century german lullist Ivo Salzinger wrote his work "De Secreto Musicae" where, after reiterate the musical authority of Boethius and Pythagoras, deals with the division of the monochord, the musical consonances and the solmisation system of Guido d’Arezzo, and following Lullus says that music is "ars inventa ad ordinandum multas voces concordantes in uno canto". However, in the “Tree of Knowledge’’, where Lullus imagines fourteen trees of knowledge, the most important is the “humanal tree’’, in which the music takes place, and we must “consider the voices to be high and low and medium, and long and short, thin and depth, proportional to the vocal and consonant accents, to adorn the voices and the melody of the instruments, that are pleasing to be heard by the hearts of the men’’. Other musical references in Lullus are found also in his “Doctrina Pueril’’, where he wrote: “The music is the art by which we have the straight doctrine to sing and play the instruments, raising and lowering the voices in a form to concur the different voices and sounds’’. This first album of the trilogy dedicated to Ramon Llull , "Conversion, study and contemplation," illustrates the youth of Ramon Llull, devoted to sensual pleasures to profane love and the cultivation of the troubadour lyric, seen through the prism of the convert who has left the vanities of the world. It includes a selection of representative pieces of some of the main musical genres that were current at the time of Ramon Llull as well as some of its most representative authors. A musical journey that accompanies the early stages of the life of Llull from the moment he begins to unfold the radical change that will take you to the intellectual illumination, which attributed a divine origin, and that will lead to the Ars offers. II. Dalmatica: Chants of the Adriatic (Dialogos/Kantaduri/Katarina Livljanić). Arcana CD A395. The dalmatica, a medieval garment used by both men and women, is mostly known as a liturgical vestment, typical for the Byzantine clergy. As a symbolic link between the Byzantine and Roman liturgical traditions, as a bridge between men’s and women’s clothing, it served as an inspiration for the creation of this project in which the four female singers of Dialogos are joined by six traditional cantors from Croatia to explore the Dalmatian liturgical musical traditions since the Middle Ages. The two distinct groups of singers in this programme chose rare pieces, following the main liturgical celebrations from Christmas to Easter, to represent traditions of this country which enjoyed a very special “double status” in the Roman church, since medieval Croatian priests were allowed to celebrate the liturgy in the church Slavonic language in regions where it was already customary. In that way, the Dalmatian coast of Croatia and the islands lived in a double, bilingual liturgical tradition: Latin and Glagolitic.Glagolitic chant was mostly orally transmitted during the last ten centuries as a distinctive feature of Roman Catholic liturgical chant in Croatia. It is still preserved in some coastal, insular and hinterland communities of Croatia, where it is regularly performed through the entire liturgical year, reaching its culmination in the Christmas and Lenten seasons, particularly during Holy Week. Liturgical books which survive from medieval Croatia also bear witness to this double tradition: next to the calligraphy of manuscripts written in Beneventan notation which came from Southern Italy, we find other sources in Glagolitic script used in Croatia. The Dialogos vocalists perform some rare gems conserved in Latin manuscripts, some of them coming from the female monastic world, while the Glagolitic chants originating from the coastal, insular and hinterland regions of Croatia are sung by the the vocal ensemble Kantaduri, creating together a rich sound fresco.